A unique peanut-shaped cocoon of dust, called a reflection nebula, surrounds a cluster of young, hot stars in this view from NASA's Hubble Space Telescope. 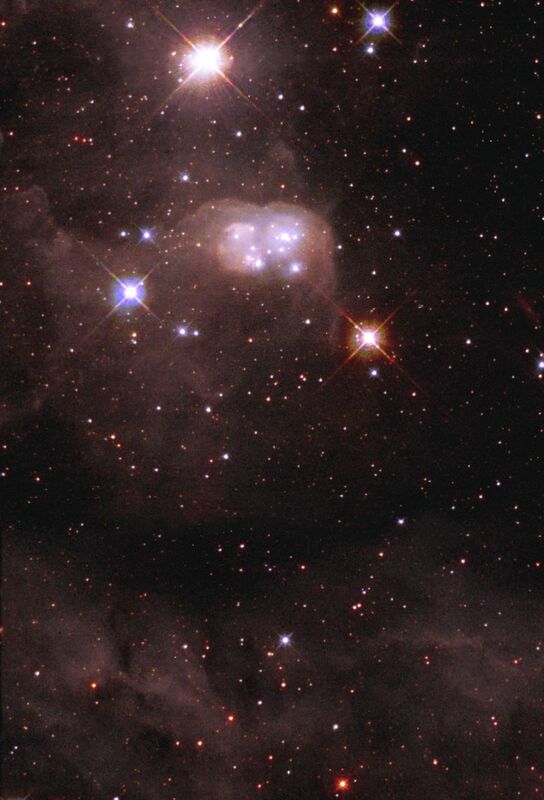 The "double bubble," called N30B, is inside a larger nebula. The larger nebula, called DEM L 106, is embedded in the Large Magellanic Cloud, a satellite galaxy of our Milky Way lying 160,000 light-years away. The wispy filaments of DEM L 106 fill much of the image. Hubble captures the glow of fluorescing hydrogen and sulfur, as well as the brilliant blue-white colors of the hot stars. The very bright star at the top of the picture, called Henize S22, illuminates the dusty cocoon like a flashlight shining on smoke particles. This searing supergiant star is only 25 light-years from the N30B nebula. 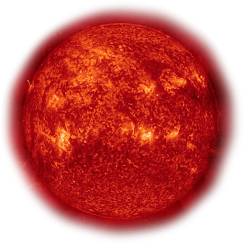 Viewed from N30B, the brilliant star would appear 250 times as bright as the planet Venus does in Earth's sky.